Are you faced with challenges to reduce costs from your processes and increase revenue? In today’s business environment, which often demands customized supply chain management, it’s crucial to have a distributor that understands what truly affects your bottom line. It’s important to find someone who listens closely, asks the right questions and designs customized services and solutions that meet your needs. Based on your business objectives, you should have a supply chain partner that focuses on ways to help you drive more revenue, reduce expenditures, increase asset performance and improve business processes. Learn more about SupplyTrax Vending, as well as other Services and Solutions. Using our just-in-time delivery and inventory services, you can reduce inventory investments by as much as 50 percent. Our customers have seen performance improve by 20-30 percent and downtime related to material shortages virtually eliminated. We make sure you have the right materials when and where they’re needed. Our construction project management services keep work crews going and plant turnarounds on schedule. With our staging capabilities, materials can be stored and secured on site, minimizing damage and reducing shrinkage. Our project coordinators meet material requirements for each phase of the job and ensure everything goes according to plan. We help locate the items you need and ensure access to the highest quality products that comply with safety standards and reliability requirements. With thousands of vendor relationships and real-time access to our extensive inventory, we can supply the materials that meet your product requirements. Our engineers and technical specialists provide comprehensive analysis of products, services and equipment to standardize materials that improve lead times, allow for more readily available alternatives and make room for products with the latest advances in technology and material specification. By removing obsolete materials and rationalizing your inventory, you free up storage space, eliminate redundant products and reduce carrying costs. 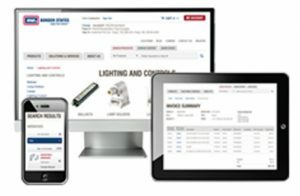 Our broad scope of products in electrical construction and maintenance; electric and natural gas utility; automation and control; industrial supply/MRO; data communications; and other areas can help reduce the number of suppliers you have to work with, saving you time and money from requisition to final use. Fast and accurate, our fleet of delivery vans and tractor-trailers log more than one million miles every year to deliver our customers’ materials. At the end of the day, we have the resources needed to deliver quality products and services to your job site. Want to learn more? Contact a Border States Account Manager in your area today.